Well. Since it's Easter, let's take a look at another Fabergé egg this Friday! 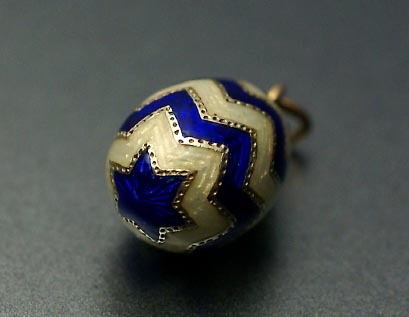 This little egg pendant was made sometime between the years 1908 and 1917! 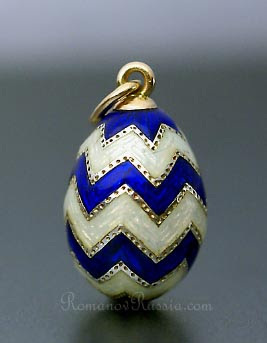 The egg is enameled with a royal blue zig zag pattern on a pearl white ground. On both ends the pattern turns into six-pointed stars. 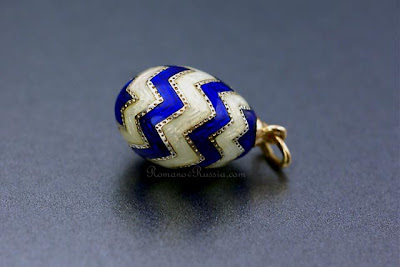 The hight of the egg is 5/8'' (1,6 cm), and the workmaster behind the pendant is Anders Nevalainen. I love this, the colour of blue is just perfect and it's just a great time to mention the egg since like you say it's Easter, hopefully you have a good one!